Here’s the Pinocchio, the official mascot of the 2013 world championships. He’s the wooden puppet who dreams of being a boy but he’s also known famous because his nose grows longer when he lies. As Wikipedia puts it “he has also been used as a character who is prone to telling lies and fabricating stories,” and no many are laughing when he’s linked to pro cycling. But things are not as they seem. Famous as a liar, the puppet is also a symbol of hope in Italy. This and more stories below. But the choice of mascot is more innocent as Pinocchio is a Tuscan character. Fiorentine Carlo Lorenzini wrote the stories and there are monuments to him and his puppet in the region and all without cynicism or irony. Indeed the story is not really about lies, it’s a more innocent tale and Lorenzini, who wrote under the name of Collodi, would often express a political vision of the future for Italy via these stories. So whilst we’re all laughing, the mascot is more a figure of hope than pity. Still when a reader* sends in the image above you have to laugh. It would easier if a few riders noses did grow although it would not be long until Italian police were leaking recorded phone calls of riders with carpenters, complete with codew0rds for chisels and asterisked diaries mentioning which grade of sandpaper to use. That the UCI recognizes its responsibilities in the Armstrong case. 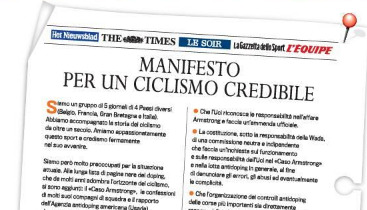 The creation, under the responsibility of the Agency (WADA), of a neutral and independent commission to investigate the role and responsibility of the UCI in the Armstrong case and the fight against doping in general; to report errors, abuses and possible complicity. That the organization of controls at the biggest races is directly by WADA and the national anti-doping agencies. That the suspensions for serious doping cases are more severe and that teams pledge to terminate contracts and not sign for a further two years any athletes suspended for more than six months. The restoration of the ‘gentlemen’s agreement’ that allowed the temporary suspension of riders involved in a doping investigation. A stronger involvement and accountability of the title sponsors of teams. The reform of the WorldTour, its points system and licensing, which remains closed and opaque. We propose that the licences are no longer awarded to the managers but to the sponsors. The organisation of a major ‘cycling summit’ before the start of the 2013 season in order to define the new organization and new rules. It’s very welcome and adds more pressure to the sport to fix things, a crowd of cheering newspapers roaring up the UCI’s more progressive members as they pedal into the headwinds. Still we know newspapers do opinion as well as report news but it’s often worrying when media become the story. Also note The Times, L’Equipe and Gazzetta are all involved the sport by owning races or pro teams (Team Sky, ASO and RCS respectively). But this shows just how big things are when newspapers from around the world link up to demand change in the sport. Hopefully the UCI listens but my worry is it feels under siege and sticks to repeating the “no other sport tests as much” message which, whilst true, isn’t enough. Here’s hoping the manifesto gets more support. One of the points mentioned by the manifesto is “reform of the WorldTour, its points system and licensing, which remains closed and opaque” and it’s true. No where on the UCI’s website is the system for the promotion and demotion of the WorldTour teams explained. We have rules of sock height available for reference but what determines whether a team gets automatic invitation is not known. Right now the UCI’s Licence Commission is reviewing the teams and it’s based on riders signed for 2013 and their total of ranking points from both 2011 and 2012. If only this could be set out. Right now there looks to be a duel between Saxo Bank-Tinkoff and Argos Oil-Shimano for the last remaining place but Euskaltel and FDJ are not far away from relegation. If only this was more transparent then the UCI rankings would become more a talking point because they have direct consequences. As said before though teams like Saxo and Argos should not have to worry too much. Wildcard invitations are there if they want them, the Tour de France without Alberto Contador is unthinkable right now and surely Marcel Kittel and John Degenkolb deserve another go in 2013? That’s text from the minutes of a WADA meeting in May 2012 where WADA and the UCI’s McQuaid discusses how riders must pay fines before returning the pro peloton following an appeal to the Court of Arbitration for Sport (CAS). When Alberto Contador was eventually banned by the CAS, it said it would offer a follow-up ruling on the size of the fine but I don’t think was ever made public. Is the “one very big current case” Contador, or is another rider or even manager paying a big fine to the UCI? If it’s been a nightmare week for Pat McQuaid with confusing press conferences, emergency management meetings, critical interviews and more then the photo above must look like something out of a dream. The scene is from China and within the cropped image alone hundreds of people are watching the race, enough to make the UCI, as owner of the Tour of Beijing, quite jealous. Is it Photoshop? 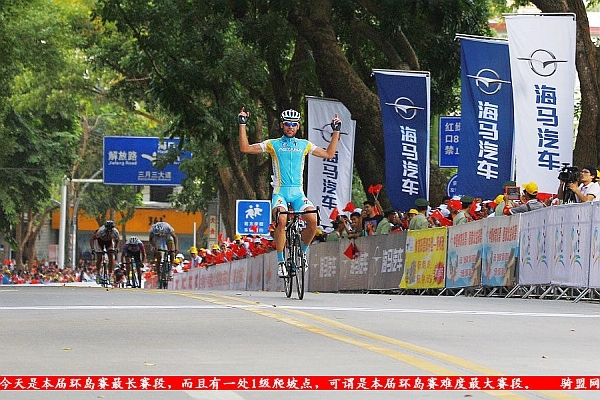 No, it’s the Tour of Hainan, it’s on now and comes via Twitter’s Biarnes72. Hainan is one of the last races on the calendar and I don’t know how many watched the race in total but it’s good to see more local races attracting people. Others have plans over the winter and today alone Amael Moinard of BMC, Saur-Sojasun’s Jeremie Galland, Garmin-Sharp’s Paris-Roubaix winning Johan Van Summeren and FDJ’s Arnaud Gérard alll got married. How about the Caribbean for a honeymoon? This weekend sees the annual Amstel Curaçao race on the Caribbean island of Curaçao. Riders get paid to fly out and enjoy a weekend with an exhibition race included alongside photo opportunities with dolphins. Finally a message from former sponsors Ride Cycling Review. They’ve sponsored the site before to promote the e-version of their magazine and a new edition has been out on the Zinio platform for a while. I promised to give it a mention but it’s taken a while to do a “Shorts” post on here given so many big stories. The Australian magazine has some good stories from the archives and if you’re after non-Armstrong related stories then take a look, for example the story of being a soigneur is available from the past for all to read. Thanks for the background on the mean of the story of Pinocchio in Italy. Having only been exposed to the children’s version of the story, I though that it was a spoof story unfortunately lifted by a reputable new outlet from some satire site. Thanks again for being so informative. Although some constructive initiative can be applauded, but if the press tries to enforce certain decisions in the sport without in depth-knowledge of the details, it becomes dangerous and does not fit in the rules of journalism. “if the press tries to enforce certain decision in the sport without in depth-knowledge(sic) of the details..” As mentioned in the article 3 of the parties do have direct links to the sport and therefore enjoy an in-depth knowledge of the sport. Certainly the Gazzetta dello Sport has long been associated with reporting on cycling, and therefore knows it’s history, controversies and triumphs perhaps better than the UCI itself. This in-depth knowledge probably gives them a bird’s eye view of the sport. There can be no doubt about this. What IS an issue is the fact that newspapers should be reporting, and not reforming. Although Editorial Journalism has existed for centuries, it is a dangerous road and challenges the notion that the news reporters are impartial. The newspapers should be wary of this and should use their power to influence sparingly lest they be accused of undue influence like Armstrong and McQuaid before them. Having said the above, there seems to be an overwhelming tide of public opinion calling for change at the top echelons of the sport. 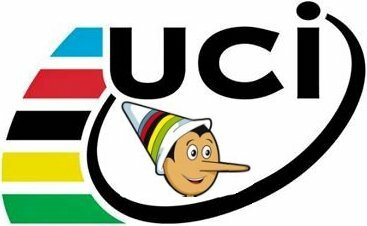 Outspoken critics (witness LeMond open letter), twitter and Facebook “net”izens, riders, sponsors, teams, have all spoken agains a high-handed approach by the UCI. This movement may fizzle out, or may gather strength… Remember we’re at the end of the road cycling season so there’s not much else to write about, except the ripple effects of the Armstrong case and the post-Armstrong world. So the Newspapers may also be padding their copy a bit in lean times. If this had all appened in May or July all of this may have been consigned to page 23 and one column instead of 3. Newspapers after all have to sell copy. Armchair critics have to vent some rage via the blogosphere every so often. Let’s see where this all leads to, and if it doesn’t simply shore up the defences at Fortress UCI in the Swiss Mountains. Remember, Switzerland has never been conquered! Thanks, even more appropriate then. The manifesto is also interesting as some of these signing newspapers sponsor races. I’m not sure I get the idea of linking the license to the title sponsor. Is this supposed to make teams more stable or make sponsors answerable for team management and riders who dope? I doubt that such a move would attract more sponsors but would drive them away by placing onerous responsibility upon them, when they are simply looking to advertise their product or company. Yes, thanks for reminding me. I thought of it earlier and forgot to include it in the write-up above. It’s an important point because they have an interest here. I think it’s the best idea in the manifesto. Sponsors need credibility and reputation, managers might satisfy themselves with profit and short-term gains. If dubious managers own World Tour licenses, there’s no way to get rid of them, for they possess something immensely valuable to both sponsors and riders. Outsourcing the business of running a cycling team to a structure run by a manager exonerates the sponsor or some of its responsibilities. Responsibilities it should take. A good anti-doping system requires the employer to guarantee the cleanness of its riders (because it’s the only one who can really control them). One positive and the team and the sponsor should be sanctioned. The riders need to get together and form a strong union. Speaking of noses, Pierrick Fedrigo anyone? Regarding the photo about the Tour of Hainan in China, I would be very careful with concluding there was a big local interest in the race. You never know how many people were there on free will and out of genuine interest. That doesn’t mean they are forced to attend by local authorities, but often ‘kindly requested to’. And if not, don’t forget that there is very little happening in the life of most Chinese citizens. Anything that breaks the daily routine is bound to attract spectators. A bike race, for which the roads get blocked for car traffic, is a major happening, indeed. There was an amateur race in the middle of nowhere in northern China last August and dozens of thousands of people were lining up the final 2-3 kilometres of the race to give the winner an experience as if he had just been crowned as the next emperor. Note that in the photo, despite the barriers, there is also a policeman standing every 5 metres to ensure nobody can see the riders coming from far away (…). Nevertheless, I agree it is better to have a lot of people rather than nobody watching the finish, and the people behind the Tour of Beijing should use these kind of photos during their next round of discussion with the authorities about the security measures for next year. After a few years I can safely conclude that there aren’t much happening in the daily life of the “western world” as well, apart from the fairly regular spectacularity of somebody get themselves absolutely wasted after consuming too much alcohol. Mind you, that happens in China as well. That said, there could be more development of cycling as a sport and there could be more amateur races. Chinese are familiar with bicycles, it probably doesn’t take a lot to convince them to look at their daily transportation method in a slightly different light. I initially thought the Pinocchio mascot for the 2013 Worlds was a joke; it came off as way too much in light of the drug drama of the past few weeks. Then, I figured it had to have a deeper cultural significance than the tale of truth-challenged puppet. the serial doper and armstrong supporter. how sad that’s the thought. Serial doper is too far for now. But my comment was based on the idea that he got a full welcome on the podium for the 2013 presentation, despite being stripped from his previous win and excluded from this year’s race. ASO have welcomed him back. I think inner ring is being a little touchy on the point of Contador. His one major effort in the Tour of Spain, after a rest day, reminded me very much of the ‘Landis day’ in the Tour. Lets not forget he was also suspected of involvement in the Puerto case and his choice of professional teams has too raise questions. Maybe he has only been caught once, but that’s once more than Armstrong. Het Nieuwsblad (formerly known as Het Volk) is involved in cycling too. They organize the Omloop Het Nieuwsblad / Het Volk, the annual Flandrien Gala and a season long trophy for the youth categories.